Figuring out if your organization should update or upgrade and how to accomplish either for the various System Center applications can be a tricky proposition. It is important to understand that System Center 1801 is NOT an update to System Center 2016; they are considered different versions entirely therefor you cannot UPDATE your way to 1801, you must UPGRADE. System Center 2016 is updated through update rollups such as the recently release UR6. There is greater risk and higher level of complexity involved in upgrading from 2016 than updating it with an update rollup. 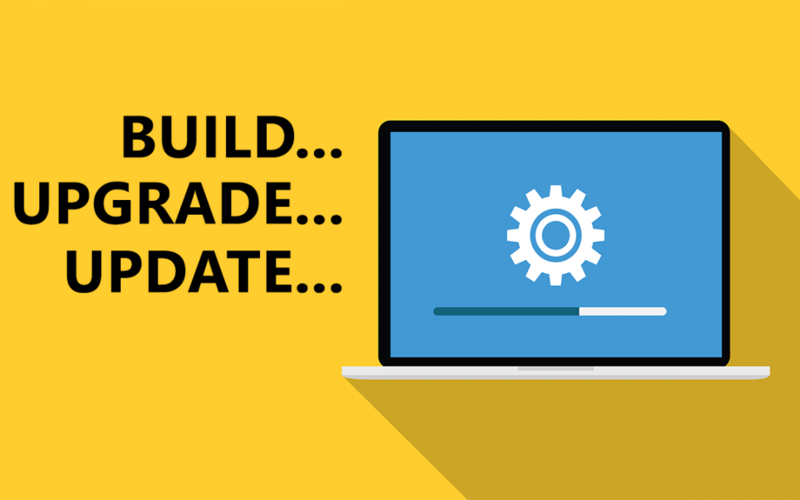 Upgrading from 2016 to the 1801 build can require an uninstall and reinstall of the application or a complex, multi-step process where an update is as simple as the normal Windows patching process. 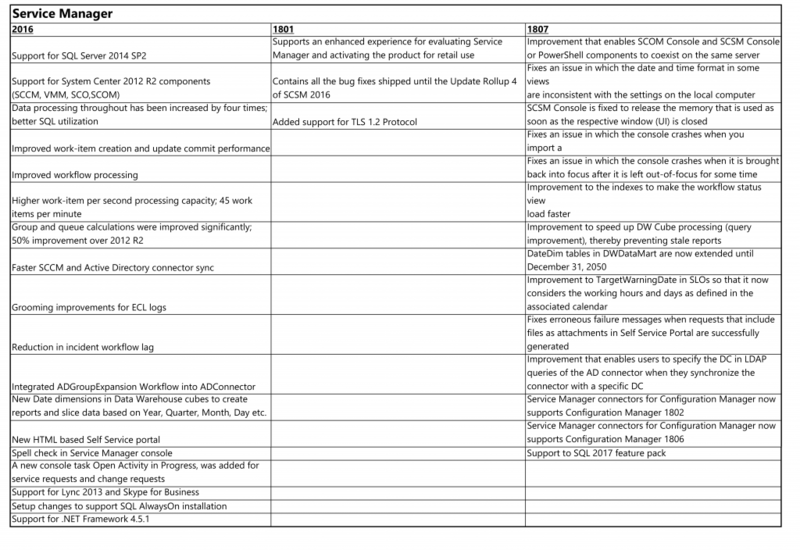 That is why we’ve done the research for you and compiled this list to walk you through the requirements for both upgrading System Center 2016 as well as the update process for 1801 to 1807. We will not cover Configuration Manager in this blog as it does not follow the path of the other System Center applications and deserves its own forthcoming blog. SCOM 1801 supports an in-place upgrade from the following versions: System Center 2012 RN UR12 to the latest update rollup and System Center 2016 RTM to the latest update rollup. While you may not need to uninstall the application, it is still a complex process. As a semi-annual release channel build, 1807 is not available as a stand-alone installation. You must have SCOM version 1801 installed to apply this update. 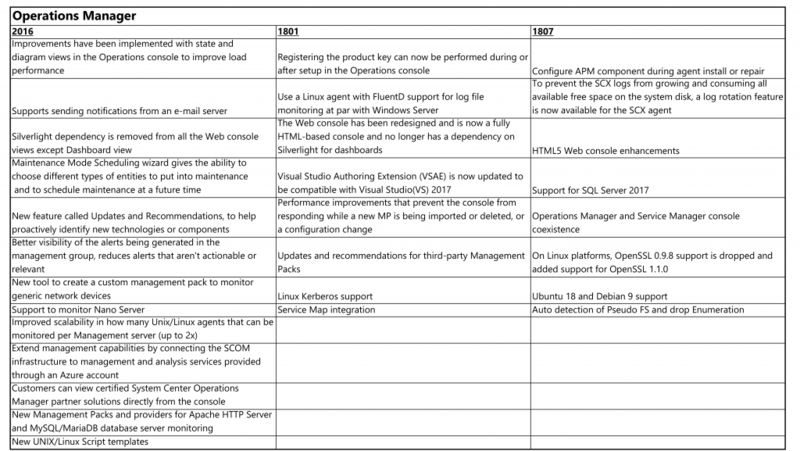 Update packages for Operations Manager are available from Microsoft Update or by manual download. Click here for more details on updating from version 1801 to 1807. For 2012 R2, ensure you have UR14 installed and for 2016, UR4 installed. Now here comes the tricky part. You must uninstall the Orchestrator management server, any runbook servers, the Web Service, and the Runbook Designer… THEN you can install the Orchestrator management server in System Center 1801. You must have System Center Orchestrator version 1801 installed to apply this update. An in-place upgrade from Service Manager 2012 R2 Update Rollup 14 and 2016 Update Rollup 4 to Service Manager 1801 is supported. An in-place upgrade is an upgrade of all Service Manager parts on the same hardware. Other approaches, such as side-by-side upgrades or rolling upgrades, are not supported. However, you can deploy version 1801 on a server that has never had Service Manager before. Keep in mind that the order in which you perform component upgrades is important. Failure to follow the correct upgrade sequence might result in component failure for which no recovery options exist. As a semi-annual release channel build, 1807 is not available as a stand-alone installation. You must have SCSM version 1801 installed to apply this update. You should be running VMM on System Center 2012 R2 Update Rollup 14 or 2016 Update Rollup 4. You need to uninstall the old version of VMM (2016) and then you can install VMM 1801. Click here for more details on upgrading from version 2016 to 1801. You must have System Center Virtual Machine Manager version 1801 installed to apply this update. VMM packages are available from Microsoft Update or by manual download. Upgrade DPM 2012 R2 to DPM 2012 R2 Update Rollup 14. If you are upgrading from DPM 2016, then first upgrade to DPM 2016 Update Rollup 4. Upgrade the DPM server to DPM 1801. Update the agents on the protected servers. Upgrade the DPM Remote Administrator on all production servers. Backups continue without rebooting your production server. You must have System Center Data Protection Manager version 1801 installed to apply this update. DPM packages are available from Microsoft Update or by manual download.